As we know, black goes with everything, there isn't a color that doesn't look good paired with it. However, there are certain colors that I just love wearing with black and one of them is orange! I will often combine these two when I'm creating a look that's a bit more edgy, which was what I was going for with this look. 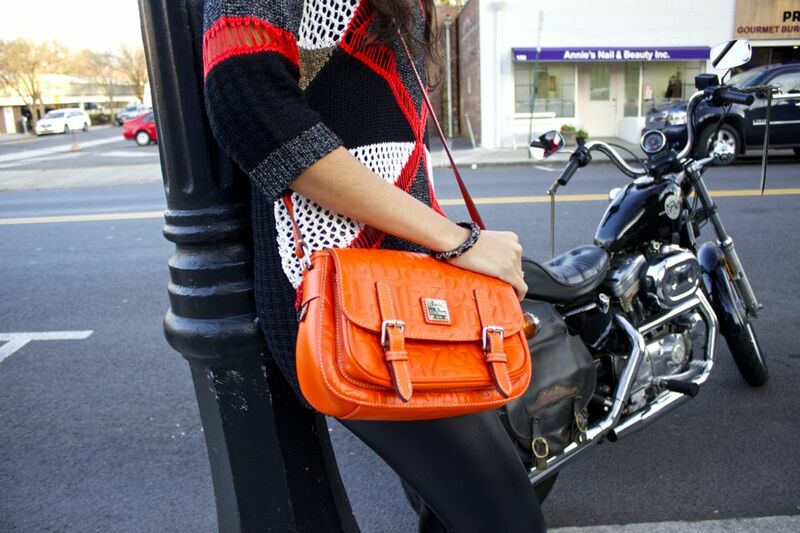 Not only do I love orange with black, I love it with leather leggings, specifically. I'm not much of a winter person, I love transitional seasons because I don't like too much of anything. If I were Goldie Locks, I don't think I would've gotten caught, I would've known exactly what to go for just by looking! At the same time, there are some winter pieces in my wardrobe that do excite me at the thought of wearing them, such as leather leggings. I love how they can add edge to a look, yet they can still look classy and a bit glam, depending on the rest of the elements in the outfit. This color block sweater looks perfect with them because the hint of shimmer in the knit, causes the leggings to look a little more dressed up, while maintaining that hint of edge I was going for, would you agree? I hope this look inspires you; if you don't know what to wear for your weekend plans, try starting with leather pants/leggings and then think of the vibe you want to create to help you add the other pieces to your look. I wish you a very happy and fabulous weekend, my gorgeous friends and thanks so much for stopping by! Next: In the Holiday Spirit Previous: Tips to Find the Best LBD for Your Body Shape!